Specimen is inserted into the mPrep/s™ capsule and held in place by the insert. A special tool is provided to facilitate insertion. If required, specimen orientation is easily achieved. Simply "pinch" the back of the sample in the insert or place it on the insert in the desired orientation. Once inserted, it will be gently held in place within the capsule. 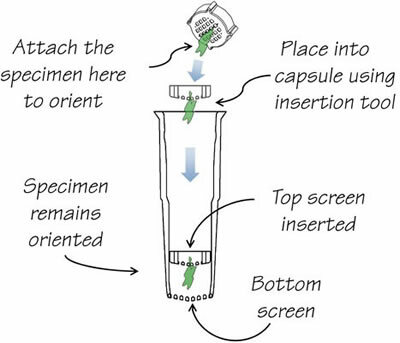 If orientation is not required, just drop specimen into the capsule and place the insert over it. Capsule is labeled with barcode or human-readable label. Capsule is fitted on a micropipetter for fluid processing steps, from fixation through resin exchanges. Capsule is removed for polymerization. Trim and section block right through mPrep/s™ capsule. Store block in clearly labeled mPrep/s™ capsule.